David West came to Eugene from Portland, and retired here after a 46-year career in Information Technology (starting at age 20 as a computer programmer). He first trained as a cleaner/socializer at our PetSmart partner location on Chad Drive in June 2016. He learned about our all-volunteer group when adopting Bella (renamed Aiofa) a month earlier. David quickly earned his 10-hour volunteer shirt, and later decided to concentrate his volunteer efforts on providing transport services to/from fosters, veterinarians, WAG, etc. – sometimes a quick trip, sometimes an out-of-towner, and sometimes a round trip that includes a long wait at a vet office. David is always responsive (including some emergencies where he has had to drop everything), always on time, and always has a friendly smile. He provides such a vital role (which is often out of sight) to support our cat rescue operations. 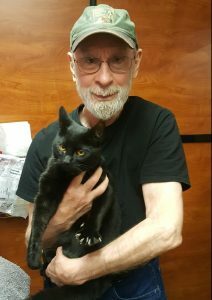 In this photo, David had just delivered two kitties from their foster in Lowell safely to our PetSmart partner on Willamette Street, where they can begin their search for forever homes. Thank you, David! Our Volunteer of the Month for May is Lucinda Henderson! 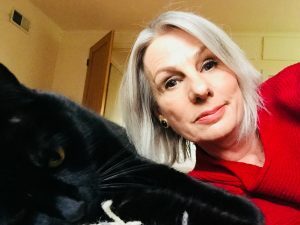 For the past few years, Lucinda has been a reliable and invaluable volunteer, especially for working with some of our more challenging cats like those who scratch or swat at people. We’re so grateful for her efforts to help socialize these kitties so that they can find their forever (preferably bandaid free!) homes. 🙂 Thank you, Lucinda! 1. You successfully completed the Eugene 1/2 Marathon, a monumental feat in and of itself! 2. You brought in, through pledges from friend and family, a whopping $1,070.26 for the benefit of CRAN’s ongoing rescue efforts. The 12th Annual Eugene Marathon will happen on April 29, 2018. 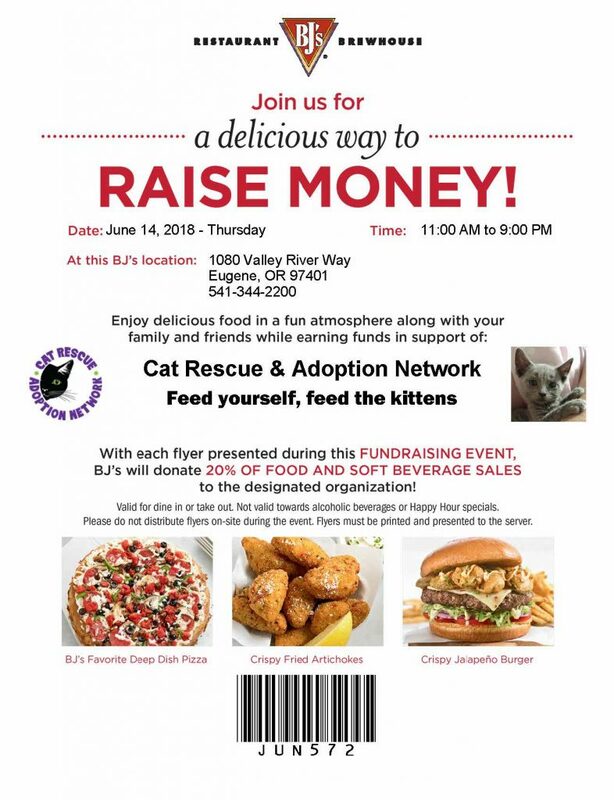 Some of our volunteers are going to run and raise money for Cat Rescue & Adoption Network by asking friends and family to donate in support of their efforts. Click on the Donate button below your runner to support them. This year I have an opportunity to combine my love of running and of cats. 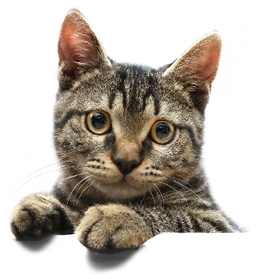 I am running my second Eugene Marathon to raise funds for a wonderful organization, Cat Rescue & Adoption Network. I became involved with CRAN last year and am amazed at the dedication of this all-volunteer and 100% privately funded 501c3 non-profit group. 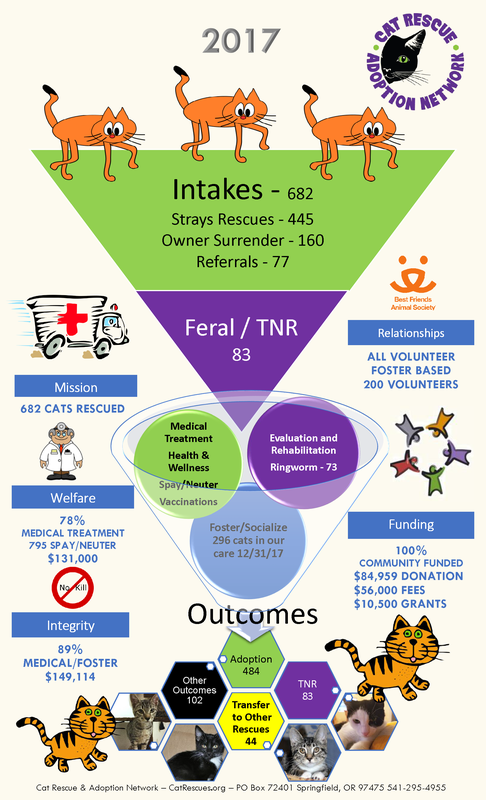 CRAN rescued 682 cats last year and found homes or transfer placements for 585. We also facilitated 704 Spay/Neuters and spent $127,000 in medical treatment. Please help me meet my fundraising goals and contribute to this fantastic cause. Join us for a night of good food and a good cause. A percentage of the funds go to Cat Rescues & Adoption Network. Must bring a copy of this flyer. This month’s Volunteer of the Month is Ashley Papendieck. Ashley has been an enthusiastic ambassador for CRAN at our Petsmart South location since Fall 2017. She loves spending time with our cats and kittens and is always a friendly face for visitors to our cattery. We are so grateful to have her on our team. Congratulations, Ashley, and thank you! 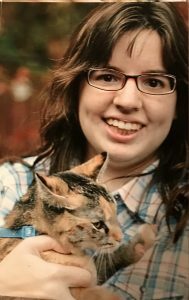 The March 2018 volunteer of the month is DeAnn Warren in recognition of her ongoing socializer shift at PetSmart North (2847 Chad Drive, Eugene) every Monday from 2:00-4:00pm since July 2017. She also makes follow-up phone calls to every adopter at the one month mark. She hears the Best Stories! Altogether, DeAnn volunteers for CRAN about 10 hours a month. She also volunteers at Willamette Animal Guild every Thursday and has since July 2016 where she is ‘on the mat’ watching over the dogs and cats as they leave the operating table from their spay/neuter surgeries. DeAnn believes in volunteering! 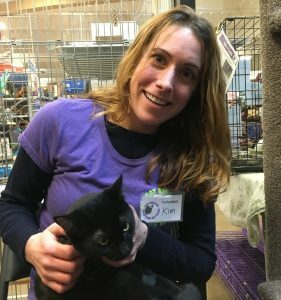 “If everyone volunteered just two hours a month for the group of their choice, it would really make a difference.” You make a difference for CRAN and our rescue kitties DeAnn – Thank You! Do you have an emergency intake with nowhere to go? Call Marci! 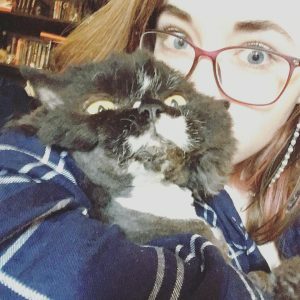 Do you need a last-minute transport to get a cat to a vet appointment? Call Marci! Do you need help with ringworm care? Call Mar — oh, you get the idea. Marci Seghetti has been a volunteer for CRAN for some time now. She is one of the team of volunteers who are feeding, loving, and medically treating the many kittens in our ringworm treatment program. She has worked on fundraising projects, she is a member of the CRAN Board of Directors (and the secretary! ), and she is always willing to add something more to her busy day, to help a cat in need. 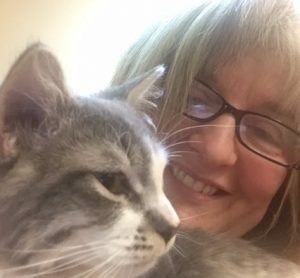 Susan Orr has (so far~) been a volunteer cattery cleaner, socializer, fundraising donor, adoption counselor and an adopter in her continuing commitment to Cat Rescue & Adoption Network (and WCDC before that) since Dec. 2007 – 11 years! Says Susan, “At that time I don’t think there was a WCDC website – the volunteer opportunity was posted on the Bush Animal Hospital website. 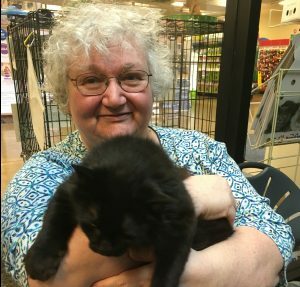 I started volunteering because I missed being around cats and my tuxedo boy Fridge (named for the football player nicknamed Refrigerator Perry) had just gone over the Rainbow Bridge and it was some time before I was ready to adopt again.” Next to founding president Kate Tryhorn (see Aug 2016 entry), Susan is the longest standing volunteer in our group – wow! In January of 2017 she also took over the monthly task to coordinate and schedule the weekend adoption counselors at our partner PetSmart location on Chad Drive in Eugene. 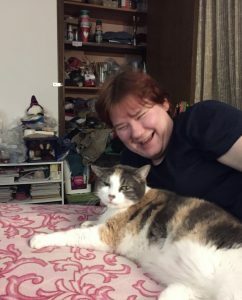 She’s comfortable in her vital role matchmaking between rescue cat and forever home on the weekend counselor shifts and often picks up vacancies when needed. She’s ever aware of the careful conversation needed for both the cat’s welfare and to find a loving home. Oh, and she works full time at the UO too! Soft-spoken and steady, Susan is professional and dependable and oh so appreciated! Her photo shows her with her CRAN adoptee “Midnight Louie” who Susan says is “always grumpy.” Thank you Susan!